Google My Business – Special Update! Google my Business (GMB), formerly Google+ or even Google Maps, is a tool for businesses and organizations to manage their online presence across Google, including Search and Maps. For most businesses, it is imperative that this information is accurate and optimized for your location. Do a search in Google for [Your Business Name + Your City] look on the right side of the SERP (Search Engine Results Page) and see your info! Send me any corrections! This is also the section where we see ‘WRITE a REVIEW‘. REVIEWS – Ideally reviews are supposed to be a representation of a customer experience. 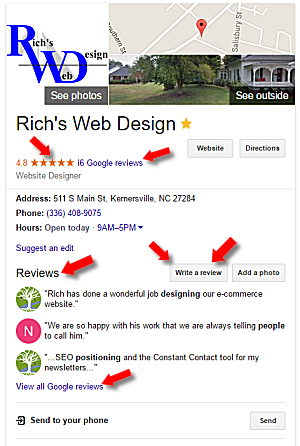 Simply asking your customers / clients to ‘Write a review of your business’ is the proper and recommended strategy. If Google thinks you are actively soliciting your customer list by incentivizing them or by asking for reviews in bulk, they will be removed. WHERE to send your customers / clients. Often it is difficult for your customers / clients to find your ‘Google My Business’ listing so directing them is perfectly acceptable. You can include a link to your GMB page in the email signature footer, but a better place is on a simple business card. I have started to assist my clients in printing business cards w/ short URLs that direct customers to their own review pages. Vista Print is a very inexpensive and reliable service for these. Go to some of the short URLs ( for example –http://bit.ly/LIS-Google ) in these business cards and see. Best-practices for requesting reviews – Ask everyone for a review, not just your die-hard, happiest customers. Point out as often as possible that you’d like your customers’ honest feedback. Your customers care, not all of them, but that’s OK. Many will write a review if you ask and especially if you give them basic instructions as to how.